We’re always preaching this one concept, but just to reiterate: if subscribers aren’t redeeming your SMS marketing offers, then what’s the point? You want to truly capitalize on this mobile communication tactic, or else you’re completely wasting your time and marketing spend. Make sure your SMS marketing offer is crystal clear. When it comes to offer creation, get as granular as possible. Stay away from vague promotions, as this will only confuse subscribers. Chances are, a confused subscriber won’t take action. Check out this great example that draws an easy to understand comparison. Show this text to get half off your order, now through Tuesday! 50% off your purchase of $150 or more, TODAY ONLY! Show this text to redeem. The second option is much more appealing, as the offer is way easier to understand and expresses a better sense of urgency. We suggest leaning towards a 24-48 hour redemption window. 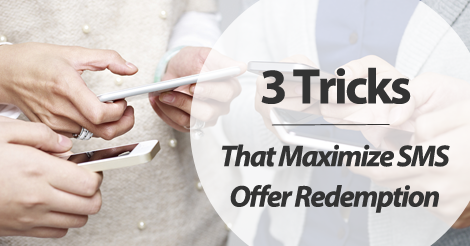 Some SMS marketing users prioritize immediate redemption, and that’s totally ok. If you want to give your customers a bit more of an open window, allow up to 3 days for offer redemption. Anything more this will eliminate a sense of urgency. Without urgency or a set expiration, most people won’t be in any rush to redeem. Finally, make your offer easy to redeem. Don’t make your subscribers jump through hoops to cash in. You want to make your call to action and redemption instructions clear and to the point. Failure to do so will result in low redemption, which means wasted time, effort, and money on your end. We would love to be your SMS marketing provider. We know what it takes to truly experience success with this mobile marketing method. Ready to hop on board? Give us a buzz at 1.800.688.6290 to learn more, or head over to our pricing page and sign up for a free plan.